Diary Pyramids at Giza. 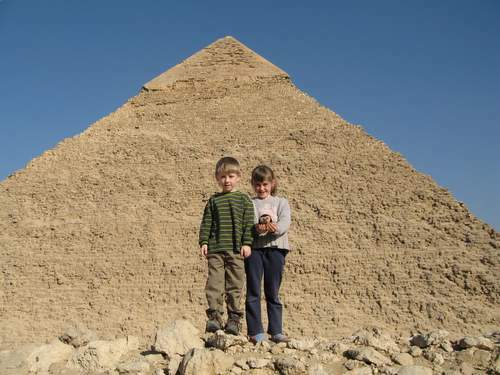 If you only see one ancient site before you die (and if you do come to Egypt you will have thousands of millennia on your hands) the Pyramids at Giza should be it. Even our normally down to earth Brummie LR was impressed. A really breathtaking experience! Watched Egypt win the Africa cup against Cote D’Ivoire. Drogba missed three sitters and actually it was as interesting as watching paint dry, but Cairo went mad…celebrations continued all night and consisted of mainly driving around waving Egyptian flags whilst beeping their horns. The Nigerian team are resident in this hotel and Senegal at Derek and Jenifers so we spot famous footballers over breakfast and the many conversations with the chefs that result in pint sized glasses of fresh orange juice for them and something more watered down for us! Visited Memphis, but couldn’t find any pink Cadilacs and Elvis was nowhere to be seen although lots of impressive statues of Rameses 2nd (the other king) Played Elvis hits in the car on the way there. Kids really confused by now. Did Elvis rule ancient Egypt Dad? No, but he must have lived here as he is immortal!